Airbnb is to start sending the Chinese government information about customers who book accommodation in China. Data shared with the authorities will include passport details and the dates of bookings. Hosts listing accommodation in China will also have their details passed on once they start accepting bookings. The online home-sharing giant said the move meant it was now complying with local laws and regulations, "like all businesses operating in China". Airbnb China - the firm's local operation - has about 140,000 listings. Hotels in China are already required to share their guest information with the government and local police. And tourists and travellers staying in private homes are also technically supposed to register their accommodation details with the police within 24 hours of arriving at a destination. Airbnb said it was simply falling in line with the traditional hospitality industry in China. 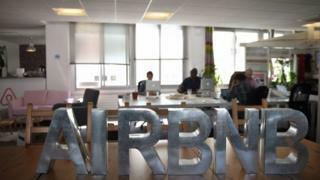 "The information we collect is similar to information hotels in China have collected for decades," an Airbnb spokesperson told the BBC. "[It is] one step we are taking as we explore ways to help our hosts and guests follow the appropriate rules and regulations [in China]." Unlike most countries, before customers can confirm an Airbnb China accommodation booking, they have to provide their passport information. Airbnb said its local entity in China already stored this information and would share it with authorities on request. But now it will be proactively sharing that data once bookings are made. Information on new hosts on the site would only be sent to the government once that host started accepting bookings, Airbnb said. The company sent an email to its China-based hosts on Thursday advising them that their information would be shared with the government from Friday. It said hosts who were unhappy about the changes had the option of de-listing their accommodation offerings. Airbnb has been focused on growing its Asia operations, especially in China, which is one of the fastest growing markets for the firm. It launched Airbnb China in 2016 to facilitate bookings on the Chinese mainland. Airbnb said it made it clear then to users and hosts that any information collected in China would be kept in the country and shared. "If you reside outside of China and do not have a listing in China, nothing will change for you," the firm said in a 2016 blog posting. "If you reside outside China and have existing listings in China, your information related to such listings will only be transferred to, stored, used or processed by Airbnb China upon your acceptance of our revised terms of service." Airbnb said at the time the change was in line with the way China's traditional hospitality industry handled stays in hotels. Airbnb China faces tough competition from the country's biggest player in the market - Tujia.com - an online home sharing site that says it has more than 400,000 listings. In an effort to attract more users in China, in March last year, Airbnb unveiled its new Chinese name - Aibiying (爱彼迎) - meaning welcome each other with love - which is easier to pronounce for Mandarin speakers. On Thursday, the firm announced the launch in Shanghai of Airbnb Plus - a system that offers guests accommodation options that have been inspected and verified for cleanliness and comfort against a 100 point checklist. It also unveiled its Airbnb Host Academy for China - a program to help hosts offer the best experience they can to guests, and to become so-called super hosts. Airbnb has said it is aiming to have one billion annual guests worldwide by 2028. The firm is one of Silicon Valley's most valuable companies and is already worth an estimated $30bn.